According to the response-dependence theory of moral responsibility, facts about whether it is appropriate to hold a certain reactive attitude (e.g., resentment) toward a person are metaphysically more basic than facts about the person’s being morally responsible. 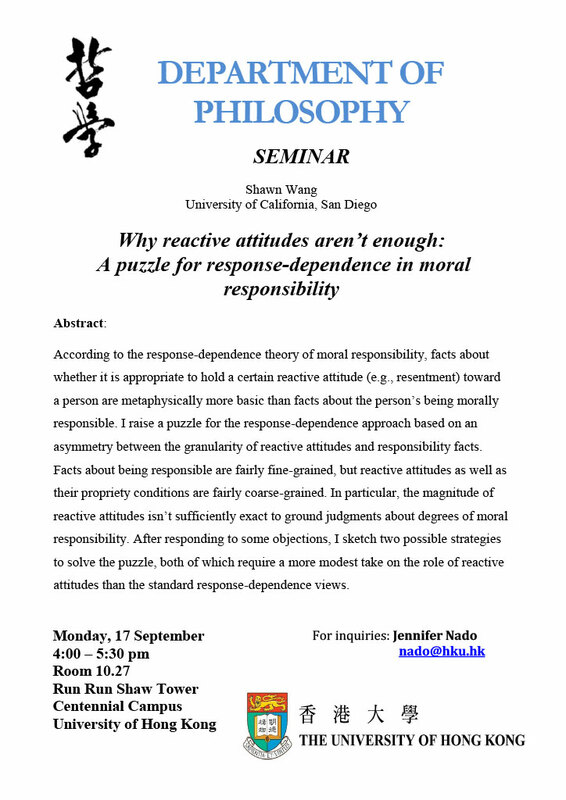 I raise a puzzle for the response-dependence approach based on an asymmetry between the granularity of reactive attitudes and responsibility facts. Facts about being responsible are fairly fine-grained, but reactive attitudes as well as their propriety conditions are fairly coarse-grained. In particular, the magnitude of reactive attitudes isn’t sufficiently exact to ground judgments about degrees of moral responsibility. After responding to some objections, I sketch two possible strategies to solve the puzzle, both of which require a more modest take on the role of reactive attitudes than the standard response-dependence views.